As a foodie, hunting down the best food in town has always been my top priority when travelling. When it comes to eating in Japan, the options are truly endless; from sushi to soba, we definitely were able to eat to our hearts content. 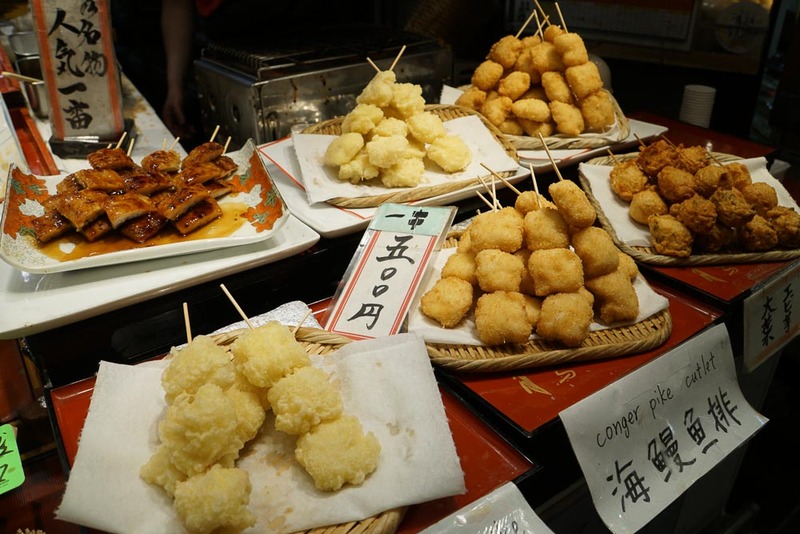 There are even guided tours around downtown Osaka’s food street. After 6 days of non-stop feasting, I’ve put together a list of our favourite food-finds in Osaka and Kyoto! I’ve even included the Japanese names and addresses in case you need to ask locals for help. You’re welcome! 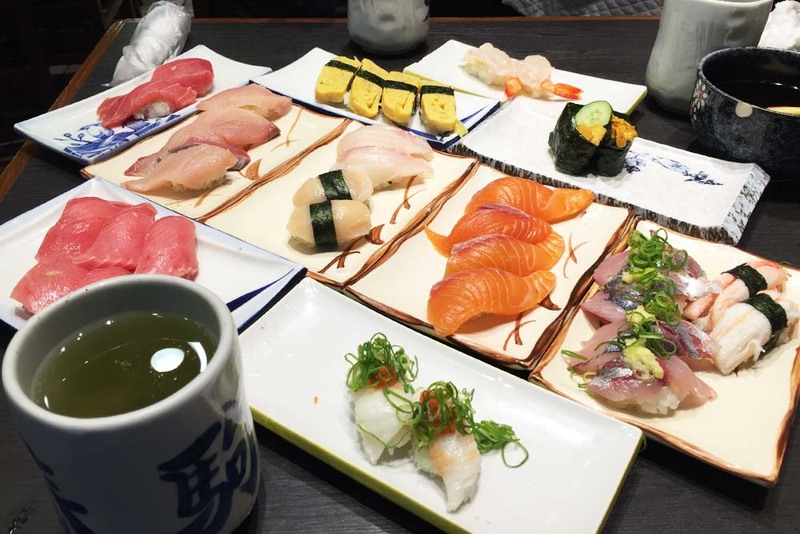 Usually spotted with a snaking queue along Tenjinbashisuji Shoutengai, Harokuma Sushi is a must go for all sushi lovers looking for value-for-money fresh cuts. Don’t get turned off by the queue as it moves on really quickly – our wait was approximately 15 minutes for 6 people in front of us. Expect generous thick raw cuts for their sushi at affordable prices. We came out with bloated bellies after having ¥6,700 worth of food for all 4 of us! Pro-tip: As the place is more catered to smaller groups, it would be good to go in groups lesser than 4 people. Our stroll along Dotonburi ogling at all kinds of street food eventually led us to Creo-Ru, home of unique takoyaki combos. Their takoyaki poached egg set caught our attention immediately and we loved how the taste of egg yolk, onions and fish flakes blended so harmoniously together. Definitely not to be missed – we slurped up all of it! Layered crusts gave way with crisp crunches as we sank our teeth into the palm-sized goodness. My tongue felt the soft custard almost immediately, a little like beancurd with pockets of sugar. The light cheesy aftertaste ensued, enticing me to take the next bite. Uchiya offers cheese tarts in different flavours too – chocolate, green tea, yuzu and more! 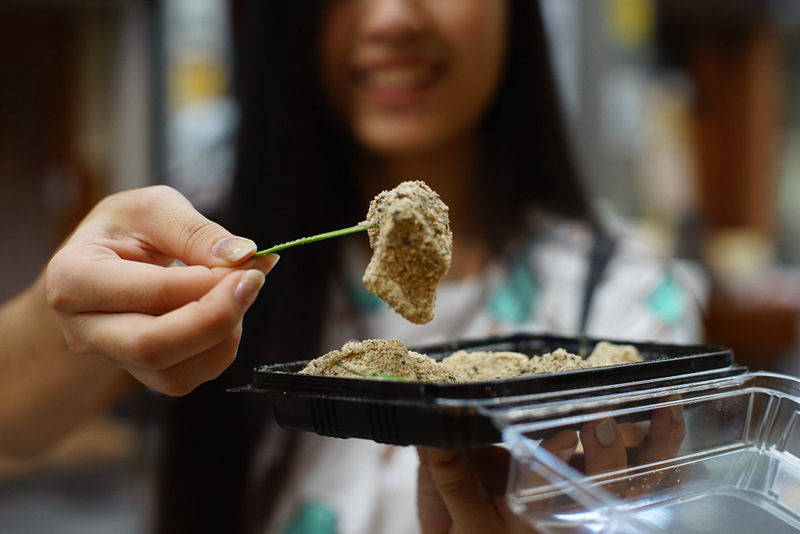 The perfect snack for the sweet-toothed, the sesame mochi was a delicate balance of the sweetness and fragrant sesame flavour. Greedily forking the satisfyingly large mochi cubes into my mouth, I was totally in love with the light nutty flavour with occasional bursts when the whole roasted sesame were chewed on. A great snack in-between meals and many other flavours to choose from! Pro-tip: Don’t be afraid to try the samples of each flavour outside the shop before deciding on the flavour! Buttery fragrance from the crust of the cheesecake wafted around the area, coupled with the catchy tune of Pablo’s song, it was almost impossible to miss Pablo’s shop front. The texture of the cake was rather cheesy and creamy, with mochi and red bean surprises hidden within. If you’re looking for bite-sized treats, Pablo serves mini cheese tarts as well in various flavours with good reviews! Crisp on the outside and pillowy soft in the inside, the toasted buttered buns were so tasty they can be eaten alone. Through their open kitchen concept, we observed how the chefs tossed huge lobster chunks in sauces and painstakingly compacted them between the buttered buns. 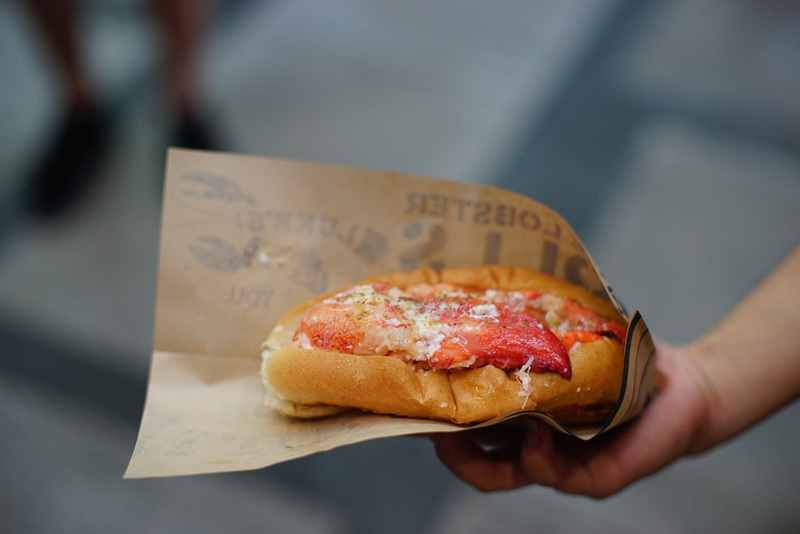 Surprisingly, the cold lobster meat complemented the warm buttered bun really nicely. 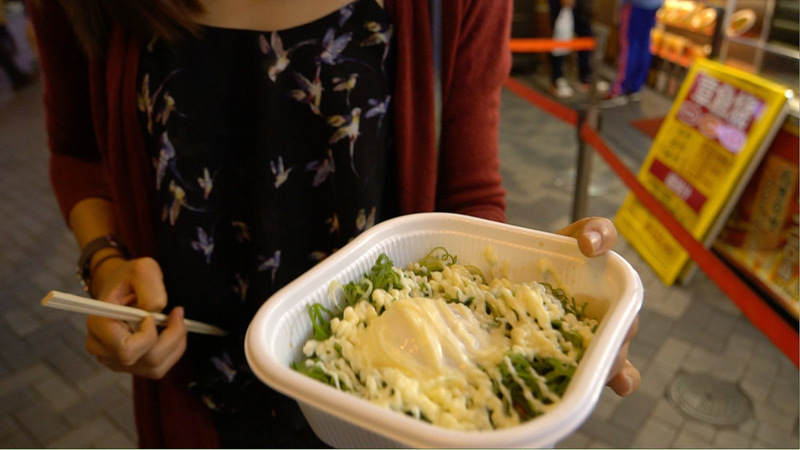 A ¥680 okonomiyaki may seem pricey at first – but the generous amount of ingredients in this savoury pancake fully justified its price and should be on your must-eat list! 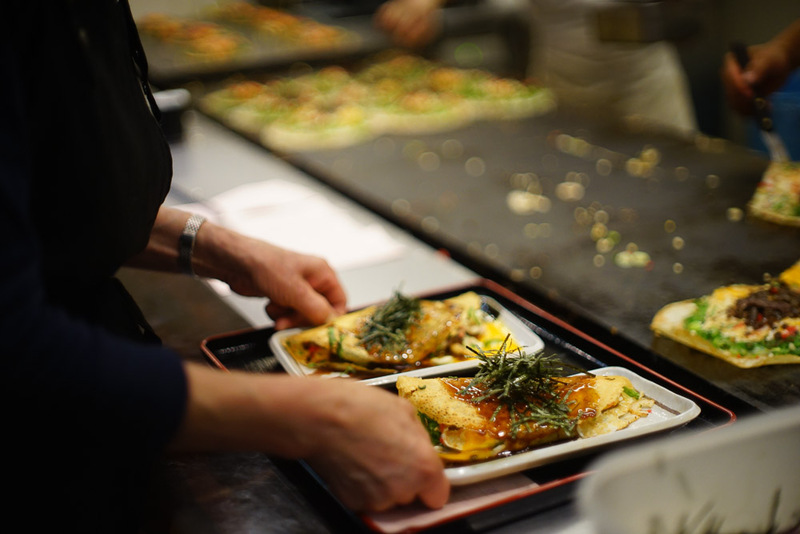 Exploding with ingredients, the okonomiyaki resembles a huge overflowing pancake. Bonus when dining in: Seated at almost every table, experience the company of a well-dressed Japanese lady.. mannequin. 😛 A little freaky at first but we were entertained nonetheless. 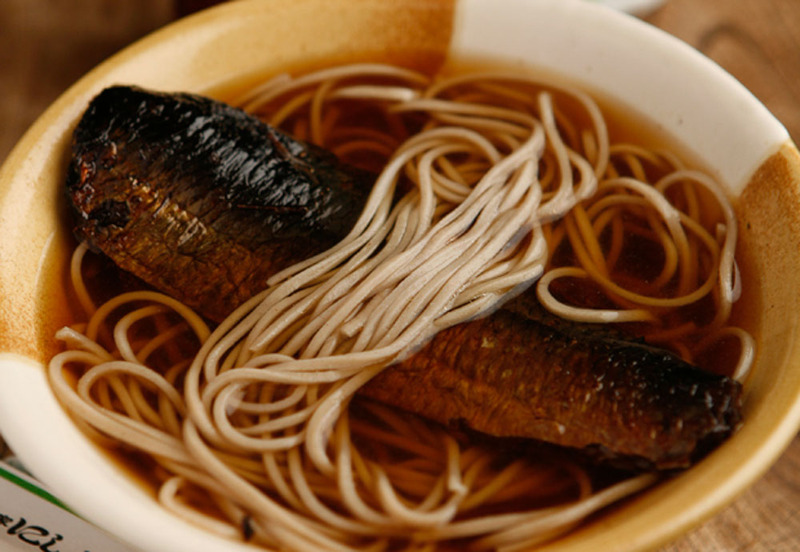 A local delicacy in Kyoto, the sweet stewed mackerel soba is not just another variation of soba available in Kyoto. The bowl of buckwheat noodles looked rather plain at first – clear soup with a piece of half submerged fish. The taste, however, was exceptional. A perfect balance of sweet and savoury, the stewed mackerel bought us over instantly. Coupled with the flavourful soup… OISHI! An exceptionally fluffy bite-sized sponge ring, these soy milk rings bring donuts to a whole new level. Each bite left me craving for more – no wonder they are sold in packets of 10; because anything less will definitely be nowhere near satisfying. 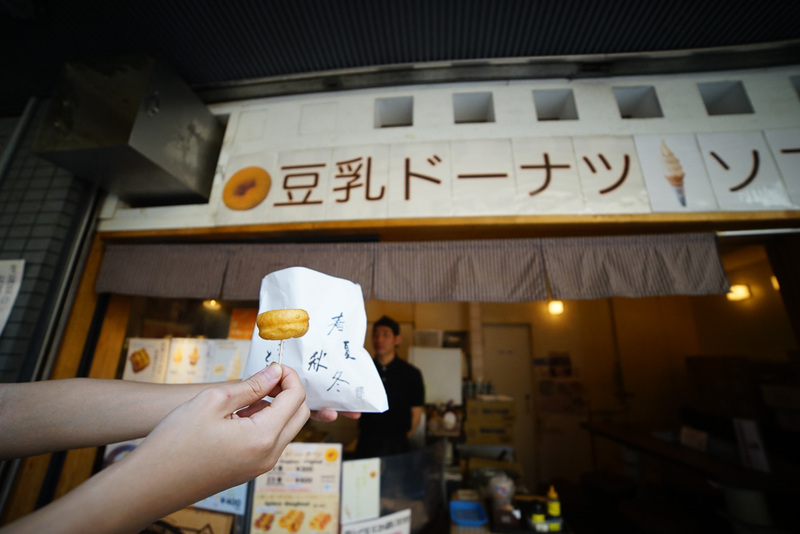 My personal favourite from Nishiki Market, the soy milk donut comes in many assorted flavours as well! Pro-tip: Soy milk donuts taste best when hot – feast on them right away! From dropping my coins into the slot and selecting my meal through a vending machine, Ichiran Ramen provided a superbly unique dining experience – of eating alone. With individual eating cubicles and hooks to hang my belongings, I could focus solely on my bowl of ramen. A setting people eating alone would appreciate. Pro tip: For those with an appetite, save some soup and add extra noodles! 130yen for half a serving and 190yen for a full serving. More than just aesthetically pleasing, this shelled dish was well worth its price tag. Enhanced with the sour tinge of lemon, the oyster glided swiftly off its shell onto my tongue. A mild taste of the sea, followed by a tinge of sweetness, and a whole lot of satisfaction. 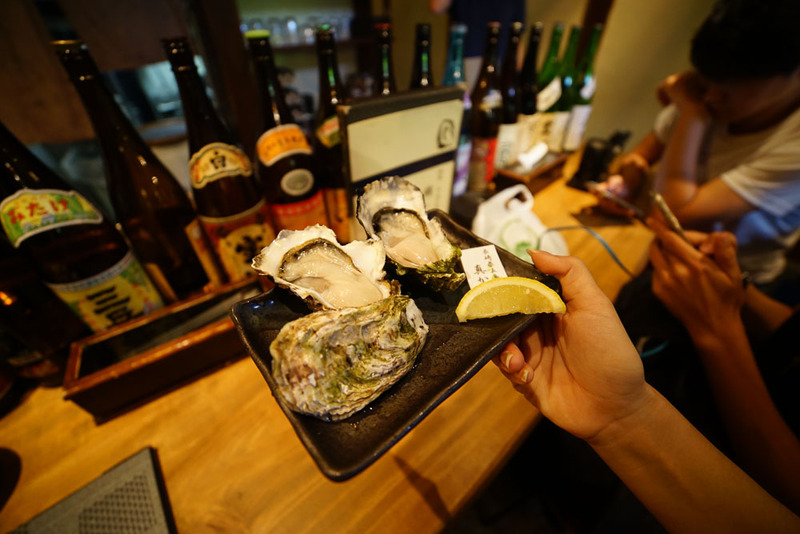 Oysters were available both raw and cooked, so no worries if you prefer cooked food! Although a pretty odd sounding dish to order when overseas, this delicate dish is no where close to the conventional ones available in supermarkets. With a creamier texture, this homemade delicacy felt more like dessert than a side ingredient or dish. 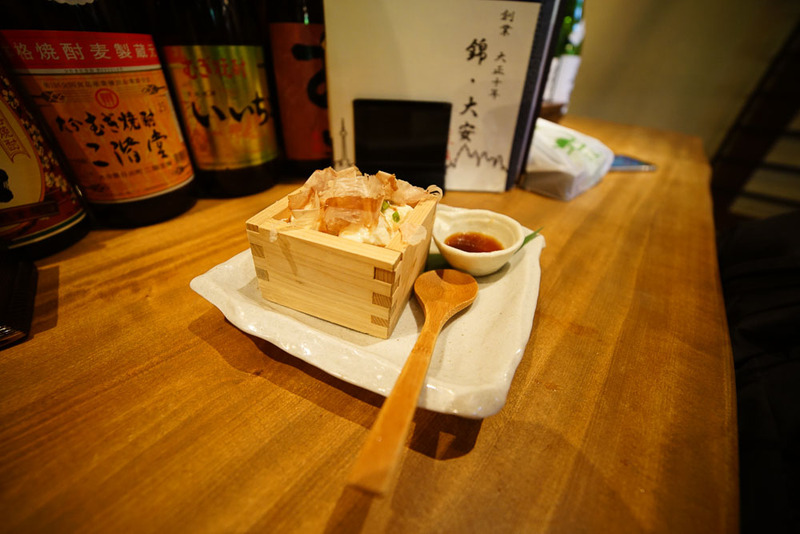 Garnished with bonito flakes and onion, this should not be missed when dining in Kyoto. As suggested by the name, the soft serve tasted a whole lot like matcha, with a lingering tinge of bitterness; unlike the usual ones that are more milky and sweet. 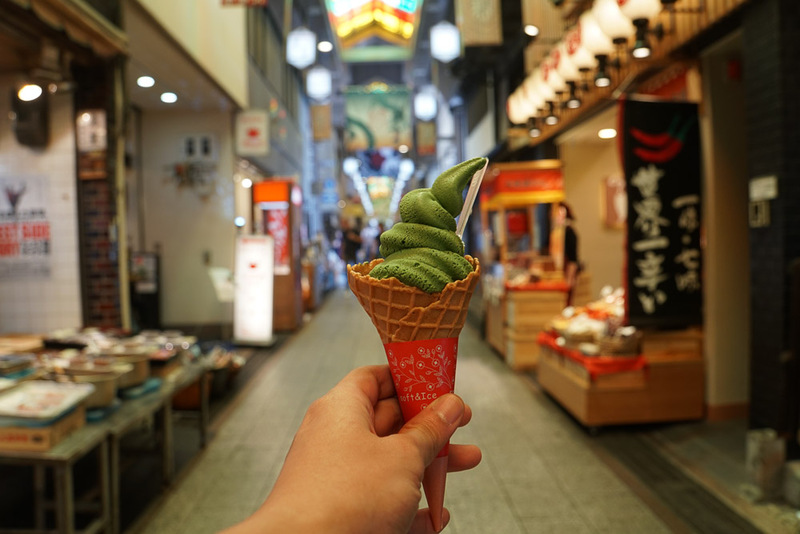 We were so hooked to the taste, regular matcha ice cream just did not hit the cut anymore – An undeniable treat for matcha lovers! A combination of the usual pau and the chinese plain buns sandwiching braised pork, the Kyoto-style beef manju bun was served scalding hot, straight out from the steamer. A tinge of Asia in every bite, the Manju Bun is filled with flavoured burdock roots and beef slices. The bun steamer was also rather huge and easy to spot along the Nishiki Market! Flavoured and heated up on the spot, these mackerel skewers sure did confuse our taste buds – in a good way. The exceptional crispy tempura exterior gave way to tender fish meat. And just in case you are wondering, there wasn’t a tinge of fishiness in the salted tempura we tried. Transport can be expensive and confusing especially for the greedy foodie (like me, and most probably you who’s reading this). That’s why we’re always looking out for the best transport passes to save us the cost and hassle! 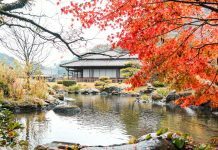 For Unlimited Rides in Kyoto, Osaka, and Kobe: Many of the popular areas in Kyoto and Osaka are covered by the Hankyu Line so the Hankyu Tourist Pass comes in quite handy. For S$9.50/16.70, the pass gives you unlimited rides on the Hankyu Line for 1 or 2 days respectively. 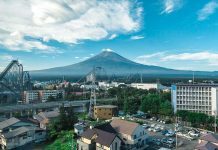 It even extends over to Kobe which is a must for foodies because Kobe beef is only a 30 minute train ride away from Osaka! For a fuss free cashless experience: One disadvantage of the Hankyu Tourist Pass is that it doesn’t cover the main subway lines in the city. You can use coins to purchase individual tickets at the station before each trip but if you’d like to skip the hassle, the ICOCA IC Card is the best alternative. This works like a rechargeable card and covers all the JR lines, subway, private railway and buses in the Kyoto, Osaka and Kobe region. 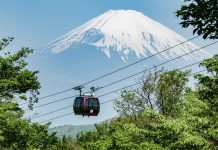 Coming from Tokyo: If your Japan itinerary includes Tokyo, Osaka, and Kyoto, your best bet would be to get the Whole Japan JR Pass for inter-city transportation. 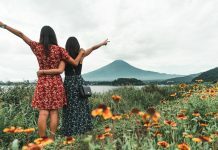 Hope you enjoyed our list of foods you must try in Osaka and Kyoto because I got super hungry writing this. 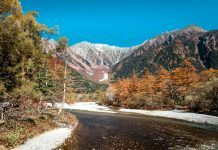 – 7D JR Pass Itinerary from Tokyo to Osaka for under S$1.1k: Cover Tokyo, Osaka and some hidden gems in between to maximise your JR Pass! Know of any other must eats in Osaka and Kyoto? Share with us in the comments section below! Let’s try to grow this list. On a perpetual hunt to satisfy her food cravings, DingYi loves to travel and shares her adventures through her visual journal on Instagram! Extremely useful! I’ll hunt according to the list, ur efforts greatly appreciated!!! Thank you (: Hope you have as much fun as we had munching our way through Osaka and Kyoto! Thank you! 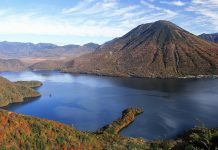 Heading to Kyoto in September! That’s great! 🙂 Enjoy yourself and eat all the yummy food while you can! Do try the black pork ramen at 〒542-0083 Ōsaka-fu, Ōsaka-shi, Chūō-ku, Higashishinsaibashi, 1 Chome−14! Soup base is black with thick pork taste. Hi DingYi! I’m really interested to know which store is it that you found the Sesame Mochi in Kuromon Market because the market is so big and there are so many stores… Please tell me! Thank you! We were just working around and spotted it! Part of the adventure is in not knowing exactly where you’ll find what! Oh wow, the Pablo Matcha Cheesecake looks to die for! I’ve only tried the original flavor but that matcha and red bean pairing is absolutely genius. Definitely gotta try that some day. After viewing these pictures, I wanted to eat. I see the dishes in Osako and Kyoto yummy and cool. I close my eyes and imagine that I eat these delicious dishes…mmmm. Thanks for this great guide! 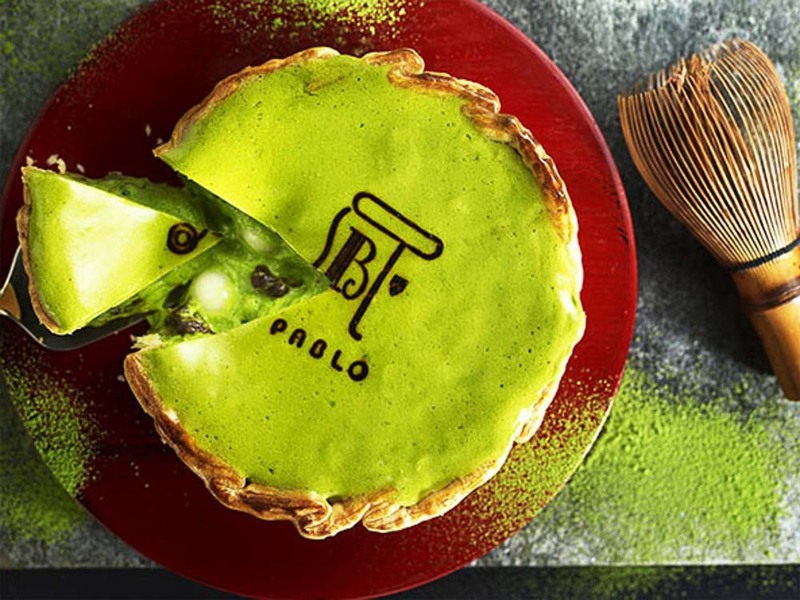 I had that matcha cheese tart from Pablo last time I visited Osaka, and I still dream about how delicious it was. 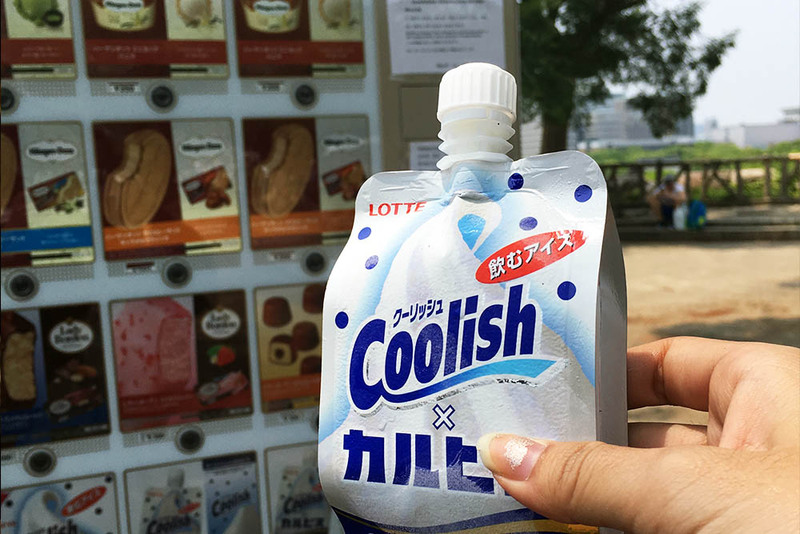 Will definitely try some of these other foods next time I visit Kyoto/Osaka! Im planning to travel to Osaka, Kyoto, Nara and Kobe. If I am getting the JR Whole pass, do I still need to purchase the ICOCA IC Card and Hankyu tourist pass? Thank you. Hello! Will you be travelling to anywhere else like Tokyo other than the cities you mentioned? Because you will not need the Whole Japan JR Pass if it’s only those cities. 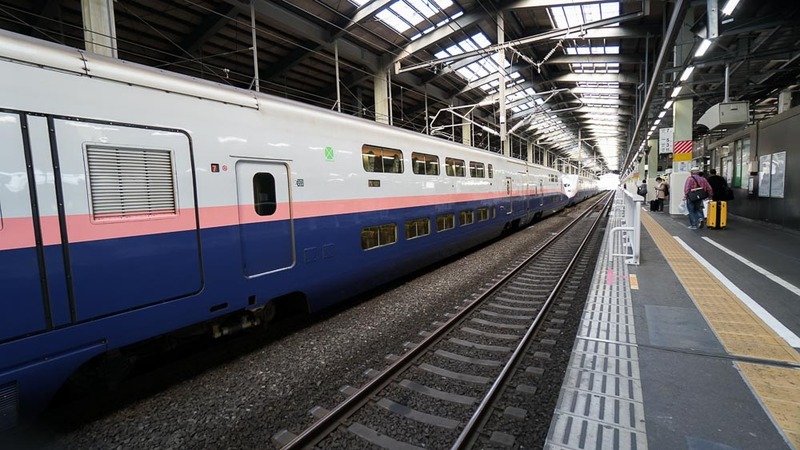 You can take local trains or utilise the Kansai West Pass (https://www.klook.com/activity/3015-4-day-jr-west-kansai-rail-pass-jr-pass/?aid=312).